This authoritative edition presents full-score reproductions of three of Liszt's best-known symphonic poems. 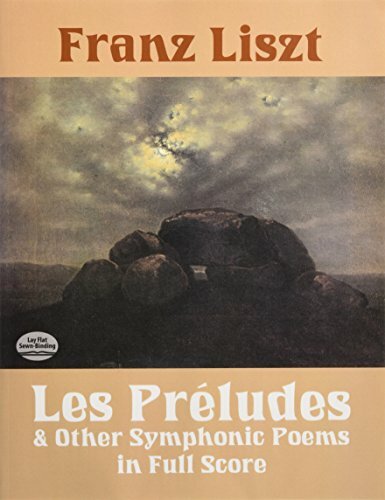 Les Préludes (Symphonic Poem No. 3) grew out of the composer's unpublished choral setting of Joseph Autran's poem "The Four Elements," blending stirring martial music and lovely pastoral themes to make this work the most popular of the symphonic poems. Mazeppa (Symphonic Poem No. 6) evokes Victor Hugo's portrayal of the Cossack leader and the symbolic triumph that comes only after defeat: "He runs, he flies, he falls, and stands up king!" Héroïde Funèbre (Symphonic Poem No. 8) is the last vestige of the monumental Revolutionary Symphony, planned but never completed, suggesting universal brotherhood: a fine, heroic, dignified funeral march. In these richly sonorous works, Liszt explored the concept of the one-movement "transformation of themes," an approach to composition that Wagner would carry forward in his development of the leitmotif. Liszt's expanding chromaticism would be no less influential, anticipating the twentieth century's embrace of atonality. Frequently performed favorites of audiences around the world, these three works are reprinted from the original Breitkopf & Härtel edition. Composer, conductor, and teacher Franz Liszt (1811–86) was renowned throughout Europe for his skills as a concert pianist. The quintessential romantic, he created an extensive and diverse oeuvre that ranges from influential experiments in musical form to more conventional pieces as well as transcriptions of works by other composers.